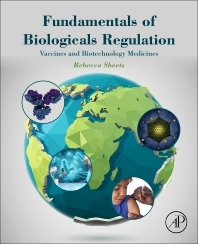 Fundamentals of Biologicals Regulation: Vaccines and Biotechnology Medicines serves as an introduction to the international regulatory arena in which biologicals are developed and offers an overview of the processes and insight into the scientific concepts underpinning global regulations. This book will provide multiple levels of readership with guidance on basic concepts, a detailed look at regulatory challenges, and practical insight into how regulators consider regulatory science and regulatory process issues across various regions. With numerous case studies, learning activities, and real-world examples across several classes of biotechnological products, this book is a valuable and comprehensive resource for graduate students, professors, regulatory officials, and industry scientists working with biologicals. •	Currently a board member and Executive Committee Member (Vice President for Human Biologicals) of the International Alliance of Biologicals Standardization •	Former Vaccine Scientific and Regulatory Specialist at the National Institute of Allergy and Infectious Diseases •	Served 9 years as a Scientific Reviewer in the Viral Vaccines branch of the Division of Vaccines and Related Products Applications at the Center for Biologics Evaluation and Research at the FDA •	From 2006-2014, served as Co-Chair of the World Health Organization’s Study Group on Cell Substrates and as Chair of the Adventitious Agents Sub-committee.